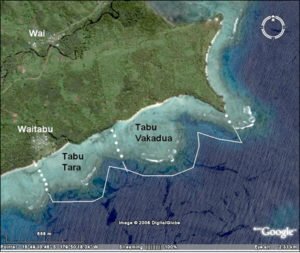 Waitabu’s marine protected area (Tabu Vakadua) is very well known, as they have been preserving it since April 1998, and no fishing of any kind is allowed there. In June 2012 a new experiment was started in an attempt to create a sustainable fishery on a stretch of reef adjoining the Tabu area. This area is called a Tabu Tara (closed/ open) and is designed to be protected for a period of time, opened for controlled harvest and then closed again. Waitabu’s Tabu Tara was initially closed for 5 years, during which time we monitored the marine life population returning to the area. Now it is time for the first 2-day opening for controlled fishing harvest, and the communities of the three matagalis (clans) involved are excited to see what their efforts will bring them. We have just spent three days in preparation for the opening, surveying the fish and invertebrate populations of the Tabu Tara area and setting out a management plan to limit the harvest to what we think will be sustainable limits. This work is being done entirely by the community, with a little advice from Helen Sykes of Marine Ecology Consulting. The first task was to find out what is living in the Tabu Tara. A hardy team of volunteers set out to count invertebrate animals such as Giant Clams (Vasua), Sea Cucumbers, and Trochus shells. The team members persisted with their task despite the cold (25 – 26oC) winter waters. Two 2-day openings per year; one to celebrate the formation of the Tabu projects, and the other for a children’s event; plus single-day openings for important community events – chiefly meetings (Bose ni Vanua), weddings and funerals. Fishing limits of 100 kg catch for 2 day openings and 30 kg catch for 1 day openings, fish only. No invertebrate animals will be taken except for Trochus shell (within size limits) from the reef slope. No destructive fishing methods, so no reef walking, no net fishing and no fishing on compressed air (SCUBA etc), and size limits of hooks to avoid targeting small juvenile fish. No taking species important to reef health, such as Giant Clams (which filter the sea water) and certain surgeonfish (Ika Loa) which control algal overgrowths by feeding on seaweeds, so creating better substrate for new coral growth. Allowing harvest of traditionally important species that have certain seasons, such as rabbitfish (Nuqa) and Balolo worms, but only from the sandy shores. At the village meeting this was explained to the community, who discussed and agreed to the management suggestions. As this is an experimental opening, they will be recording their catch, and new surveys after the opening will help to decide whether these, or new limits should be set for the future. We look forward to this new part of the Waitabu project, that of truly sustainable fisheries management by the community itself, and to sharing the experience we gain with the rest of the Fiji Locally Managed Marine Areas (FLMMA) network of communities.